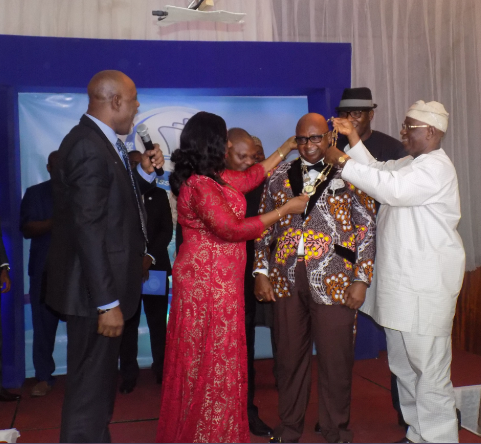 It was a gathering of who is who in the Nigerian maritime industry as the new executive of the Ship Owners Association of Nigeria (SOAN) led by Dr. MkGeorge Onyung, a medical doctor turned ship owner was officially inaugurated last Friday. It will be recalled that SOAN, two a fortnight ago, held its election to elect new executive that will pilot its affair for the next two years leading the emergence of the set of leaders that were just inaugurated. Speaking shortly before the inauguration, the immediate past President of SOAN, Engr. Greg Ogbeifun described the association as a child of circumstance which started from a non-existent status to an existing status adding that the journey was not very easy but they stayed focused even as he noted that their objectives and mission was very clear, “to establish an association of ship owners that will stand in a place of support to our industry and to our country”. Ogbeifun while appreciating the ship owners who he said had taken a position to ensure that this association stayed alive, also appreciated their sacrifices, the inconveniences, the financial support that they gave to the association saying that the association as it stands today, enjoys not only national recognition but also international recognition. “I want to implore the incoming executive under the able leadership of Dr. Onyung to continue in the direction we have been coming, to continue to make the association an asset to the agencies of the industry, to the key stakeholders, the International Oil Companies who are our principals, players upstream and other players downstream, we continue to engage with various levels of government because without you really, they may have policies but may be unable to implement those policies”, he counseled. He therefore thanked the members of the association for the support they extended to him and his executive imploring them to extend that kind of support to the new executive. On his part, the new President of SOAN, Dr. MkGeorge Onyung observed that he was a very lucky president as he was elected at a time when the shipping industry in Nigeria was hurting noting that all the people that needed to help them had woken up and had risen to the occasion as they stood very ready to help them in the business. Onynug promised that he was going to ensure that they form teams in SOAN so that they could together create a focus based group specific on issues like the cabotage, the CVFF and differentials in the Dollar and Naira rates saying, “we sit down and get a good depth of what we want to do, understand the problem very well and engage the various stakeholders collectively, continuously with robust and focused engagement to ensure that we negotiate with them, we dialogue with them in a very non-confrontational manner, to be able to get the benefit for our members”. He continued,” In SOAN, we are going to ensure a cross-sectorial and inter-association dialogue where we will be able to talk to because you have Master Mariners, you have engineers, you have stevedoring, you have manning companies, all of us are affected when we get into the waters. So, we will be able to extend and create for a platform where we will be able take our problems exactly to where it belongs. We will be able to engage with the Navy now that we have gotten inaugurated, from next week, my executive should get ready, we are going to go on visit to anybody that is anybody to make sure that we can begin to interact with them because this is our industry, this is our business. “We have a lot of bad loans that are hanging on our necks, we cannot die with these loans, we have the opportunity to pay off all these loans, we have the opportunity to look at other innovative, sustainable methods that we can fund our ships”. Speaking shortly before the inauguration of the new executive, the Chairman of the occasion and former Managing Director of the Nigerian Ports Authority (NPA), Chief Adebayo Sarumi who traced the circumstances that gave birth to SOAN said he never thought that the association would be where it was today adding, “but I think at the end of the day, I am the happiest man on earth because I never thought that we have Nigerians that could come together and provide the type of leadership in the shipping sector that the SOAN outgoing executive has been able to provide under the leadership of Greg”. While thanking the out gone president and his executive for making the association and Nigeria in general proud, Sarumi added that this was the first time in Nigeria that one could have the emergence of a group of people that could be called ship owners in the real sense of the word. “On this note, I want to congratulate, first and foremost, our own INEC, Margaret, I am not surprised that you handled this, what we thought could ordinarily have turned into what we had five years ago, you handled it beautifully well. I want to thank you most sincerely for that. No wonder the Honourable Minister saw it and made you the Chairman of the Shipowners Forum but even in spite of that, I still know that even if you are not the Chairperson of the Shipowners Forum, you are still going to give us the quality of the election that you have just handled. Thank you very much indeed. “I am happy that the election is without rancor and that is because all of you believe in the ability of those who put themselves up to contest the positions that they are capable of running and keeping the vision, the mission and the quality of leadership that you have been given which is what is making Nigeria to be extremely proud today. I want to thank you very much for that”, Sarumi said. Earlier in her opening address, the Returning Officer and member, Board of Trustees of SOAN, Barr. Mrs. Margaret Orakwusi pointed out that members of SOAN had been involved in building the shipping industry in Nigeria in less than five years of its formation adding that the association had come to be a reference point that whenever anybody talks about shipping in this country, its voice must stand out which according to her showed the integrity of members of the association. “So, you are here collaborating with the real ship owners in the country. Our election has always been free and fair completely and it sets the standard for other elections in the country, as a matter of fact, in the whole world and again, after the result, we also shake our hands in fellowship, no looser, no winner. We are all winners in progress. So, I think it is a good example for every association, every country because the essence of leadership is service. We got that from the outgoing executives; we even expect more from the incoming executives”, she said. Also speaking, the Chairman, Oil and Gas Free Zone Authority (OGFZA), Mr. Umana Okon Umana while disclosing how seriously the Authority take Shipowners Association, admitted to the fact that the outgone President actually initiated the involvement of the Authority with the association which he said prompted him to pledge to work with them. 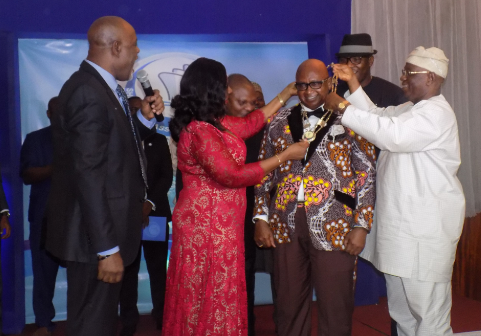 Umana who was represented at the occasion by Ini Obong Jackson, while congratulating the new executive said, “just like what we told the outgoing executives who obviously are still going to be part of the success story of the association, we will continue to work with you and whatever ways we can collaborate, the Board, Management and Staff of the Oil and Gas Free Zones Authority, even our investors because we need to create the right synergy, we congratulate and thank you and look forward to working more with you”. Contributing, the former President of the African Shipowners Association (ASA), Mr. Temisan Omatseye while describing Nigeria as the biggest player in the maritime industry in Africa, looked forward to the active participation of SOAN in the continental shipping body saying, “we look forward to working with the Africans and hopefully, we will be calling to do a courtesy visit to your executive and share the vision of where we want to go”. Photo: (L-R) Outgone SOAN President, Engr. Greg Ogbeifun, SOAN Returning Officer, Barr. Mrs. Margaret Orakwusi, new SOAN President, Dr. MkGeorge and former Managing Director of NPA, Chief Adebayo Sarumi during the inauguration of new SOAN executive last Friday in Lagos.